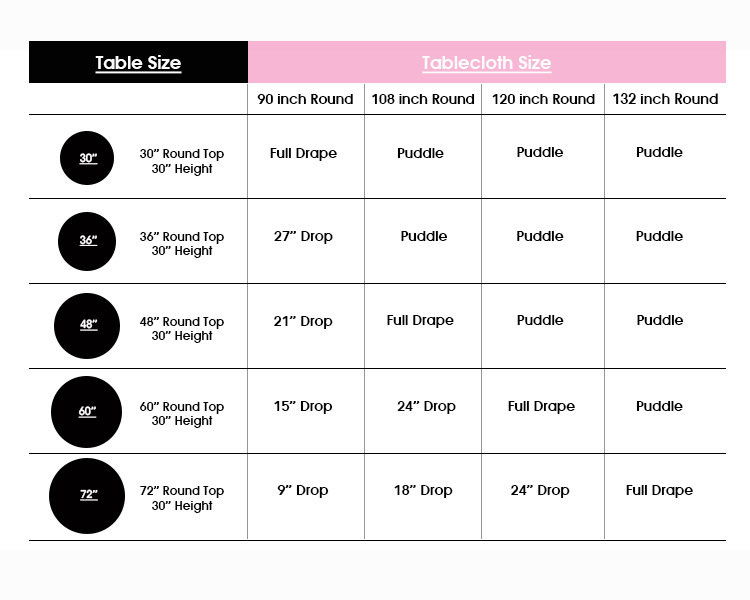 We created the table linen sizing charts below as a helpful tool when you are determining the perfect tablecloth size for your round or rectangular tables. It is easy to make purchasing decisions and implement design ideas if you know how to measure tablecloths that will match the style that you are looking for. For these charts, we used a standard banquet table height of 30 inches. 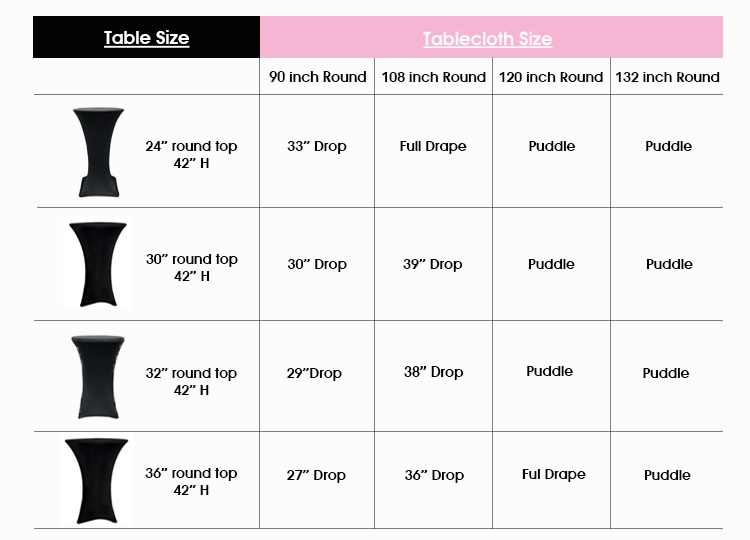 Also, throughout our tablecloth sizing guide you will see the terms "tablecloth drop" or simply "drop." These words refer to the length of the tablecloth that will hang down from the tabletop. 72 inch or 6 ft round tables - 132 inch round table cloths for a full drape, 120 inch round for some leg room. For a snug fit, we also recommend using 6 ft spandex table covers. 6 ft or 72 inch rectangular tables - 90 inch x 132 inch rectangle tablecloths or 6 ft rectangular spandex table covers. 8 ft or 96 inch rectangular tables - 90 inch x 156 inch rectangle tablecloths or 8 ft rectangular spandex table covers. We offer high quality spandex tablecloths for highboy tables. Available are 24 inch, 30 inch, 32 inch, 36 inch, 30 x 30 inch and 36 x 30 inch spandex table covers and for cocktail tables with table height of 42 inches. Sometimes though, extra elegant events demand creative styling for these types of tables. Instead of the usual stretchy fabric table cloths, wedding and event designers choose to use round tablecloths as highboy table drapes. Before you go online table linen shopping, use this tablecloth sizing chart that will help you determine the right tablecloth size for this table that is also known as bistro table. The appearance of your styled cocktail tables will vary, depending on the material of your table linen. Polyester tablecloths offer matte elegance. Satin linens will paint your event that highly-desired silky look. Round pintuck tablecloths promise a more sophisticated appeal. The choice is for you to make.